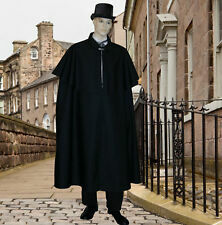 CAPE:- The cape is made from a mixed fibre green damask fabric which has a wool like look and feel to it. UK Size 6 8 10 12 14 16 18 20 22 24 26 28 30 32. The sweep of the hemline is 120" (304.5cm). BLOUSE:- The blouse is made from a cotton blend fabric with a small floral print on a cream background. UK Size 6 8 10 12 14 16 18 20 22 24 26 28 30 32. The front has small pleats and a drawstring neckline with burgundy satin ribbon which is finished with decorative beads. CAPE:- The cape is made from a mixed fibre green and burgundy tartan fabric which has a wool like look and feel to it. SKIRT:-The skirt is made from black duchess satin fabric. The edges are bound with burgundy satin binding and it fastens with three black frog fastenings. Victorian /Georgian /Edwardian /Steampunk style lace cuffs. The cuffs are elasticated at the wrist so one size will fit all. Forget swords and daggers - this cool gun is the ultimate steampunk option. With a great mix of rustic and futuristic style it is bound to match your outfit and look the real deal. 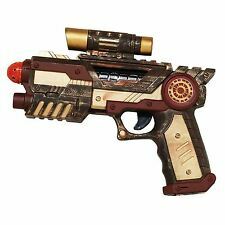 Steampunk Gun. Key Steampunk item. Punk Gothic Fancy Dress. Adults steam punk gun, goggles & hat. The jabot can be worn with just a shirt or blouse for a Victorian look or for horse riding. This is the perfect accessory for Victorian, Edwardian & steampunk. Whitby Goth weekend and Halloween. Four luscious layers of deep purple lace, gathered and attached to a double aubergine taffeta back. 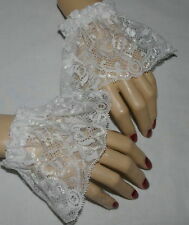 Ladies Victorian /Georgian /Edwardian /Steampunk style lace cuffs. Made from black lace the cuffs are elasticated at the wrist so one size will fit all. 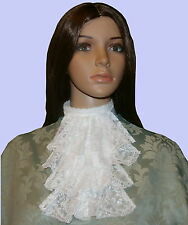 This Jabot could also be used with a ladies blouse to give it a Victorian look. This Jabot is exclusive to Cornucopia and is our own design. A necessary accessory for steampunk's wardrobe;. - Application: Cosplay,photo prop,outdoor sports etc. - Tough blue lens provides impact resistance with magnifying loupes;. - Adjustable elastic band;. Victorian /Georgian /Edwardian /Steampunk style lace cuffs. Made from black lace the cuffs are elasticated at the wrist so one size will fit all. A necessary accessory for Steampunk‘s wardrobe. 1 x Goggles. - Material:Plastic,glass,elastic band. This clever mask uses a glasses design for a more comfortable fit. The Skeleton Skull makes this mask perfect for Halloween or Steampunk Cosplay events! Mix it up, even and go as a creepy alternative Zombie Skeleton Pirate! 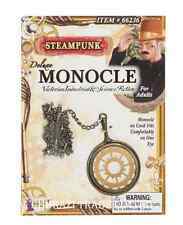 YOU ARE BUYING STEAMPUNK HAT INCLUDES WOOL FELT BLACK HAT WITH CHAIN, GREY COGS AND DETATCHABLE GOGGLES WITH A BRONZE EFFECT THIS HAT WILL REALLY MAKE YOU LOOK THE PART AT YOUR STEAMPUNK FANCY DRESS PARTY!. Inspired by a military officer, the jacket features arm badges to give you that stamp of authority! Official ‘Steampunk’ product. Collared brown shirt with attached waistcoat vest. Gold decorated embroidery. 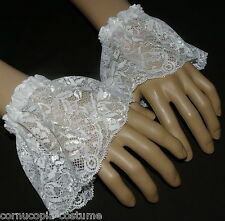 Victorian /Georgian /Edwardian /Steampunk style lace cuffs. Made from purple lace the cuffs are elasticated at the wrist so one size will fit all. Nice inexpensive Victorian Steampunk accessory. This black Victorian double breasted vest has a shawl collar and 2 real breast pockets. Vest will fit a 42"- 44" chest max. Style Vest. 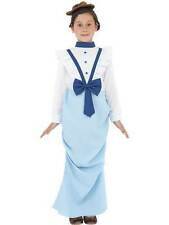 It's made of a light weight polyester, in the front, and the back is a light weight stretch fabric. Gold Deluxe Victorian Monocle. -1x Monocle on chain. -Fits On One Eyeglass with Cog detailing. -Bronze and Gold colour with Iron colour chain. We Will Appreciate Your Efforts And Cooperation. Tough blue lens provides impact resistance with magnifying loupes;. - A necessary accessory for steampunk's wardrobe;. - Fits different head size with adjustable elastic band;. - Adjustable elastic band;. A necessary accessory for steampunk's wardrobe;. - Application: Cosplay,photo prop,outdoor sports etc. - Fits different head size with adjustable elastic band;. - Adjustable elastic band;. - Glass thickness: 2mm/ Approx. A necessary accessory for steampunk's wardrobe;. - Application: Cosplay,photo prop,outdoor sports etc. - Tough blue lens provides impact resistance with magnifying loupes;. - Fits different head size with adjustable elastic band;. Cushion Rubber Ring for SteamPunk GOGGLES. 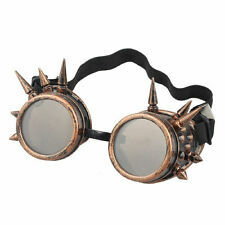 Use this comfortable rubber lining to customize your SteamPunk Welder GOGGLES. goggles are not included, just the rubber rings. Cushion rubber lining ring.